The Brady Campaign to Prevent Gun Violence wants to literally erase the names of mass killers from major web sites. To do that, the group is releasing a plugin for the Chrome web browser. "You can wipe away the killer's name and image from your screen, and replace it with something that truly deserves our attention -- the victims," the plugin description says. The marketing firm Ogilvy & Mather is the Brady Campaign's partner on the project, dubbed "Zero Minutes of Fame." The project is independent of the "No Notoriety" campaign, but carries the same message. "No Notoriety" is a concept promoted by Caren and Tom Teves, whose son Alex was killed in the attack at an Aurora, Colorado, movie theater in 2012. 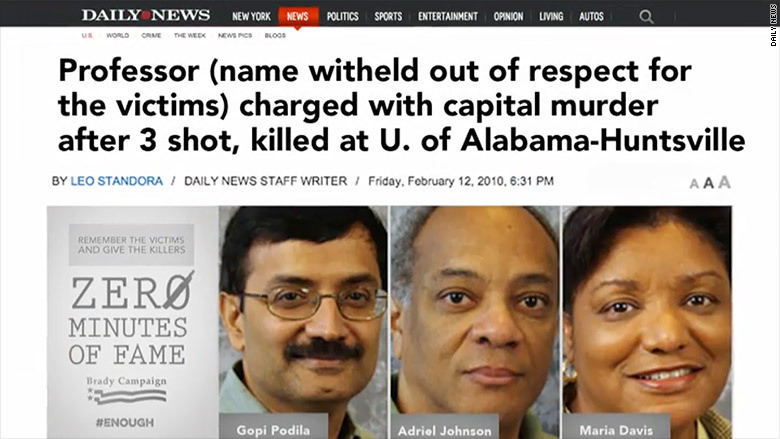 Since January 2015, the Teves and other families of shooting victims have urged news outlets to refrain from naming and showing mass killers. "In an effort to reduce future tragedies, we challenge the media," the "No Notoriety" web site says. Both the family members and now the Brady campaign are questioning news media norms around shooting coverage. The media "has a role to refrain from memorializing monsters by splashing the names and faces of shooters all over television, newspapers, and the Internet," Brady Campaign president Dan Gross said in a statement. There are a variety of counterarguments, starting with the fact that journalists have a duty to document incidents in great detail. But there have been discernible differences in coverage of recent mass shootings, giving the family members hope that their position is being recognized. The Brady Campaign's initiative also includes a petition which, it says, is intended "to encourage the media to stop showing the perpetrators' names and images on their channels." The form doubles as a way for the advocacy group to enlist more email list members. As evidenced by Wednesday's "Zero Minutes of Fame" launch, Chrome browser extensions have become a creative form of media criticism. There are more than a dozen Chrome plugins to filter or transform the word "Trump" on web pages. HBO and John Oliver promoted one that changes Trump's last name to Drumpf.